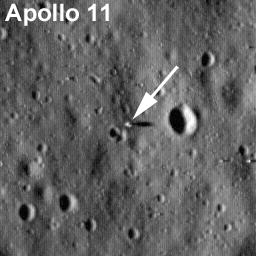 NASA's LRO sees Apollo landing sites!!! 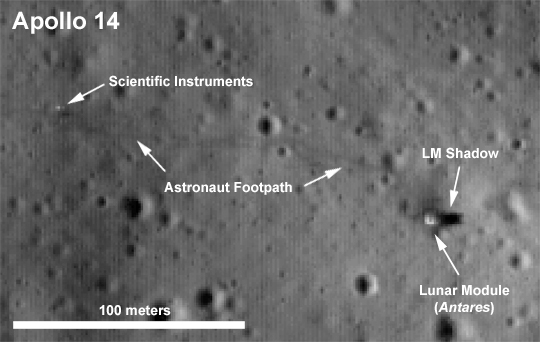 After reaching Lunar orbit on June 23, the NASA’s Lunar Reconnaissance Orbiter (LRO) reurned its first images of the Apollo mission landing sites. The images were captured between July 11 and 15, and still don’t have full resolution, since the Orbiter is not yet in in its final orbit. By then, the images will have two to three times greater resolution. In this one, the Apollo 11 Lunar Module (Eagle) can be seen. The area is very smooth, and the module is the only feature to cast a long shadow. In this one, we can see the Apollo 14 Lunar Module (Antares), and even the astronauts footprints, leading a path to scientific instruments left on the Moon. These are wonderful pictures. It is really great to be able to see the marks of human activities in another planetary body. Hopefully this will shut up once and for all those Moon-hoax believers.